What’s amazing about the Animas River catastrophe is that the EPA did not, through its actions, take responsibility for ineptly poisoning a river. About the most you can say is that it didn’t deny its responsibility. For about three or four days after the accident, it did not even warn people downstream that it had sent poisonous heavy metals into their watershed, and from their into their wells. 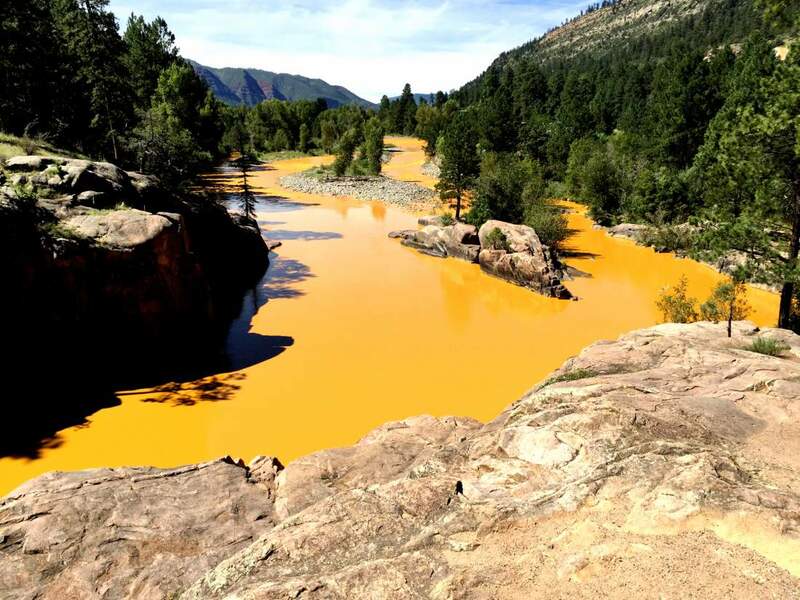 Residents’ first sign of trouble was the appearance of sick, yellow-orange water in their beautiful river. In fact, the whole river turned yellow for hundreds of miles downstream, in both Colorado and New Mexico. Animas River before the spill. Animas River after the spill. EPA estimates the Gold King Mine dumped more than 400 tons of toxic metal into the river. What was the remedy? Let the heavy metals settle out! That’s correct. The only way to make the river clean again was to wait until the lead, arsenic, cadmium, and copper settled into the soil beneath the river, or next to the river. EPA couldn’t do anything about that. “Damage is done,” they would say, “what can we do?” Well one thing they could do is work with state water officials in both states to make the best of a dangerous situation. Yet I read an article not long ago, by the head of New Mexico’s water quality department, that said EPA has virtually ignored him and his state. The same goes for Colorado. The official said EPA’s message has been clear enough: “You’re on your own.” That’s the response from the government agency that poisoned the drinking water in the first place! If residents of Flint want to know why government authorities treat them with such indifference, they ought to get acquainted with their friends in New Mexico. What a pattern of behavior. Just as Barack Obama coolly remarks, “Yeah, we tortured some folks,” EPA seems to respond calmly, “Yeah, we poisoned some folks. We’ll deliver bottled water, and hope for the best.” The best you can hope for is that EPA responds with a little urgency. Who hires these people? Are they idiots, jaded, or corrupt? You could say the people who cause the spill are idiots, the people who respond to the spill are jaded, and the higher-ups who let responders act that way are corrupt. Aerial view of the Gold King Mine on August 11, 2015, six days after the spill. The issue won’t go away because spring runoff from the mountains figures to stir the metals back up. The original spill occurred last August, when the river runs low to begin with. The hottest part of summer in the southwest does not come with a lot of rain. Metals settled out of the river over a month or more, so by the end of September the water looked better, even if you could see yellow-orange residue along the shoreline. Now you have a lot of snow melting, which means the river’s water will start to churn. People have to drink bottled water again, to be safe. They certainly can’t rely on EPA to give them timely, accurate information about water safety. To make a brief comparison, consider the size of two famous spills. Eleven million gallons of oil flowed from the Exxon Valdez into Alaska’s Prince William Sound in March 1989. Three million gallons of metal-laden water flowed out of the Gold King Mine last August. The big difference is that Prince William Sound and the Gulf of Alaska contain far, far more water than the Animas River. The oil sludge damaged wildlife and scenic beauty, bad enough, but it did not affect people’s drinking water. Yet EPA acted more vigorously against Exxon than it did against itself, when its own actions endangered people’s safety. In fact, EPA appears to be happy if people forget what it did at Gold King Mine. As people in the area observe the way EPA has acted, they wonder how much help they really want from an incompetent agency that practices neglect, and takes carelessness to new levels. Remember, people warned EPA not to bring heavy equipment into the vicinity of Gold King’s entrance, where an unknown quantity of water was dammed up. “Too dangerous,” local experts said. “Stay away from there.” Yet EPA ignored the advice, went in with their bulldozers, destroyed the dam, then mumbled “Whoops” to themselves while they quietly watched a decades old reservoir of metal laden water flow into the river. Afterwards they went home. They let people along the river discover for themselves, days later, where EPA’s reputation for callous stupidity comes from. Another remarkable thing about the EPA’s behavior is avoidance of any action that would concede responsibility. For the Alaska spill, the feds took Exxon to court, and extracted a little over a billion dollars in criminal penalties and civil cleanup costs. For the Deepwater Horizon explosion in the Gulf of Mexico, federal authorities demanded, and received, more than twenty billion dollars in damages. Yet when EPA itself causes harm, it pays nothing. Note the middle word in EPA’s name: Environmental Protection Agency. If they actually cause harm to the environment, what then? Don’t they owe something to the people they harmed, just as Exxon and British Petroleum did? Instead, when Colorado governor John Hickenlooper asked about cleanup funds, EPA told him they need a formal letter from him, to place the site “on a national priorities list for Superfund.” If that sounds bureaucratic, it’s intended to be. Superfund is intended to clean up toxic waste left in the ground before EPA’s regulations outlawed that kind of disposal. It is not intended to clean up EPA’s own toxic waste! The same agency that demands billions for oil cleanup has nothing to offer when it pollutes the water supply for an entire region. The feds have a legal concept that covers EPA’s behavior: reckless endangerment. If you act in a manner where you ought to know you risk harm to others, you’re liable for the harm you cause. If EPA’s behavior does not qualify, I’m not sure what does. Yet EPA pretends the spill is one of those things. If it supplies enough bottled water to local residents, the problem will eventually go away. Just like in Flint, where residents still have lead in their tap water. Good article Stephen. I did not know about this in detail. It’s a sad commentary on the EPA. Nothing to see here, move along. Typical.